'Sanctuary Cities' Promise Legal Fight After Sessions Threatens Funds : The Two-Way "The Trump Administration is pushing an unrealistic and mean spirited executive order," New York City Mayor Bill de Blasio tweeted. Local officials are promising a legal fight in the face of a block on grants from the Justice Department over immigration enforcement. Here, protesters pray outside the Immigration and Customs Enforcement office in New York City this month. In Seattle, Mayor Ed Murray said, "I'm willing to risk losing every penny of federal funding to stand by our commitment to protect everyone in our community." Seattle's Welcoming Cities policies, Murray said, are a way to help the local community "by assisting residents on the path to citizenship and warmly integrating immigrant schoolchildren into our classrooms." Leaders in other cities, from San Francisco to Chicago and Washington, D.C., have also said they won't agree to the demands that were laid out in an executive order signed by President Trump. Days after it was signed, San Francisco sued the Trump administration. By threatening Monday to withhold as much as $4.1 billion in federal grants, Sessions targeted cities and towns where local law enforcement agencies take steps such as refusing to honor detainment orders from Immigration and Customs Enforcement unless the orders also include a warrant or court order that establishes probable cause. "Such policies cannot continue," Sessions said, as NPR's Jessica Taylor reported. "They make our nation less safe by putting dangerous criminals back on our streets." As Jessica also noted, several studies have shown immigrants to be less likely than native-born Americans to commit a crime. 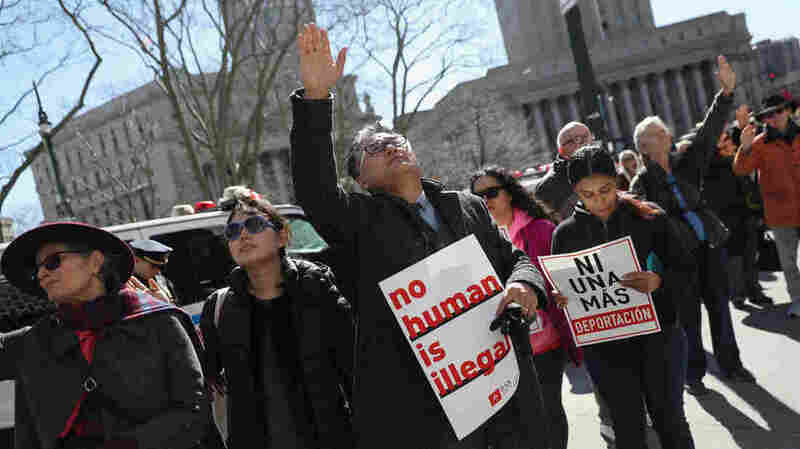 The push to use funding as a way to force cities to crack down on illegal immigration could affect 118 jurisdictions — that's how many cities and counties ICE recently said had rejected requests to detain immigrants. As a map created by the Center for Immigration Studies shows, while many of those jurisdictions are clumped on U.S. coasts, dozens of them are scattered around the country, with concentrated areas in states such as Iowa and Colorado. Editor's note on Aug. 16, 2018: Three paragraphs of reporting from freelance journalist Danielle Karson have been removed from this story because they included a quote that NPR has determined was said two months earlier than her reporting implied. NPR has issued a statement about similar ethical violations in some of Karson's reporting. It is posted here.